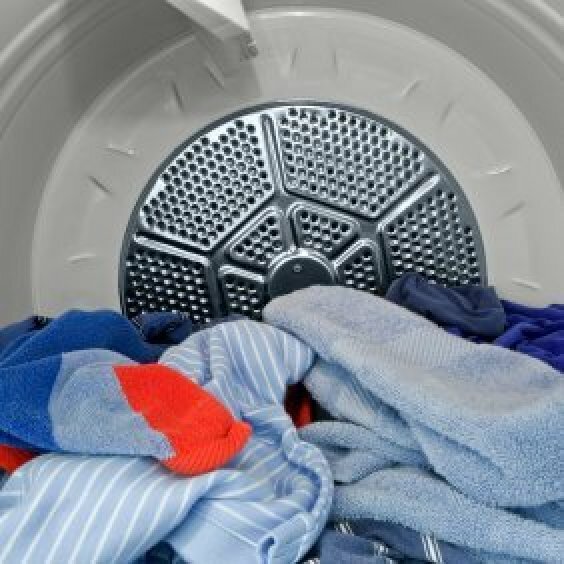 A clogged dryer duct can prevent your dryer from working efficiently. It also poses a potential fire hazard. This is a guide about keeping your dryer duct clear. First off try and hang laundry outside to save electricity, and wear and tear on your dryer. You can always air fluff with a couple of tennis balls for a few minutes to soften up material. Second, try and air dry towels over the shower door or shower curtain rod. These produce the most lint of all your laundry. Third, Always clean your vent screen before every drying cycle. Clean the vent with a vent brush at least once a month or more often. These are long handled, flexible brushes that fit down the vent hole. Fourth, you can take the back off your dryer once a year to vacuum out the inside of the dryer or have your appliance repair person do it for you. This really works. Remove the cover of the lint filter. Wet your finger and remove all visible lint. Under running water, scrub the filter with a toothbrush and a little liquid detergent. Continue scrubbing until water runs freely through the filter. Return the cover. This really improved my dryer's performance. How do you make sure your dryer vent is not clogged up like a chimney? Should they be cleaned yearly? Personally I liked to clean mine every few months. I always got enough lint out of there to scare the bejeeburs outta me! I use a clothes line now but was a bit fanatical about cleaning the hose and vent duct when I had a tumble dryer because I was really afraid of fire. There are brushes you can buy at any d-i-y centre that go up the vent/hose and knock off the accumulated lint; you can also tape a dish mop to the end of the vacuum hose and send it in that way. At least twice a year (at the very least) you should remove and inspect the vent hose, clean it and the duct work to the vent. The easiest ones to clean and replace are the rigid aluminum ones, those plastic things are super hard to clean, tear easily, and are dangerous. The aluminum foil ones are not much better than the plastic ones. If you are really handy you can disconnect the machine from the wall and pull the back panel to clear the lint out of there, but be careful about static electricity sparking a fire. Read your owner's manual for specifics to your machine; if you don't have one it's easy to Google and find a free one to download.